There’s nothing like travel to cement a great relationship. Shared experiences, whether good (those sunset cocktails) or not so good (that crazy taxi driver) have the ability to take your friendship to the next level, from friends who brunch to people who know each other inside and out. However, because travel can be daunting and stressful at times, and everyone reacts differently, travel can sometimes mean disagreements with friends, or in the worst case falling out completely. I mean we’ve all had friends who’ve gone on a trip together and never spoken afterwards haven’t we? Not ideal. For 2015 I’ve planned to travel more with my best friends, it’s like packing all the time we miss together (living all over the world will do that) into an intense couple of days that we’ll remember forever. I just got back from a trip with my best friend to Thailand, we had a great time! To make sure we get the best out of these holidays, I’ve learnt to apply a few little steps, so that our friendship is stronger after the trip rather than feeling like you need to have a holiday away from each other! On the subject of expectations, if you’re travelling with someone different to you (and you’ll find most people are), chances are you won’t want to do everything they do, and vice versus. The key here is compromise, to work out what would make you both happy, and to also each do a few things for the sake of the other person so as to meet in the middle. Don’t hate this though, you might just find your new passion! Money can be a tricky subject when travelling, and shared expenses can be confusing to work out. It’s firstly important to work out what the other person’s budget is so both of you are comfortable with the hotels/flight/restuarant etc choices you’re making, and then to work out a functional money approach so you both are happy with how it works. You could have a shared ‘kitty’ that you both contribute to and shared expense come out of that, or you could work on a ‘I pay for one, then you pay for one’ process. Make sure to work it out at the beginning of the trip so no one is left feeling out of pocket. Let’s be honest, regardless of how perfectly suited you are, there will be times when you annoy each other. But instead of allowing something to bottle up and cause you to unleash after a few glasses of wine, try to be open and honest with each other. Open the lines of communication before you go by sharing with each other things you personally do that could annoy your friend – mine may be that I have to take so many photos and my friend’s could be that she likes to sleep in. By starting out honest and caring, hopefully down the line when something major comes up you can talk it through. On the same token though, don’t be scared about disagreeing! An argument never killed anyone. Having some time alone when you’re travelling is key to enjoying shared moments. Having separate bedrooms is a great option when travelling but often not one that is financially viable, if that’s the case a few hours to do your own thing in the afternoon can make a big difference! If you’re lucky enough to be able to travel with your friends this is going to be an experience that you’ll remember forever. Your friendship is going to be so much stronger for it so remember to enjoy every minute and don’t let yourself fall into annoyance easily. Have Fun! 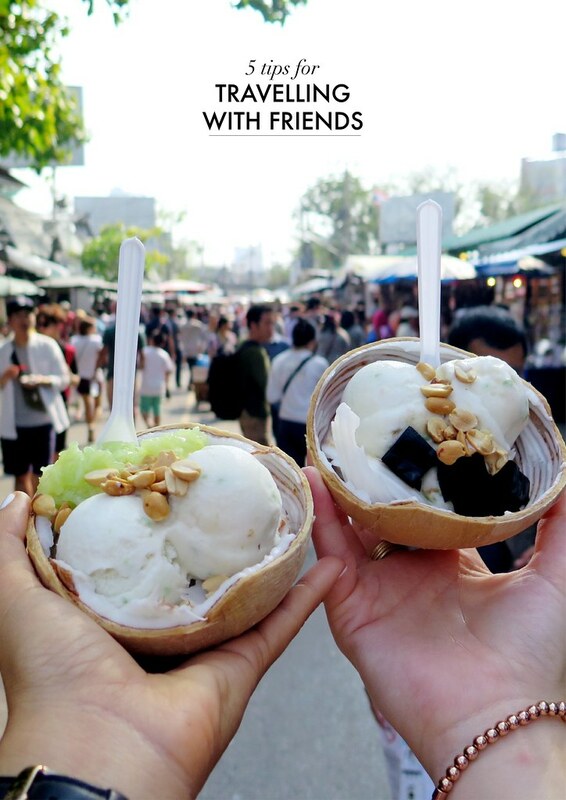 Do you have any tips or experiences about travelling with friends?